"Hitzer" is the Swiss word for heater. However, to energy-wise people across America, Hitzer is one word that stands for quality. Every Hitzer heating system is carefully hand built by Amish craftsmen. Only the finest materials are used. And no shortcuts are taken. Each system provides efficient burning with effective consumption of secondary gases. The result - more heat with less fuel consumed. Note: This item is excluded from all free shipping promotions. Hopper opening - 14" × 6½"
Unit to Sidewall: 19"	Flue to Sidewall: 28"
Unit to Backwall: 27"	Flue to Backwall: 18"
FLOOR PROTECTION - Floor protector equal to 3/8" noncombustible millboard or equivalent, extending 18" in front, 8" each side and 12" rear. Note: This item will ship by semi truck to a freight terminal near your home. Before the item ships, we'll contact you to arrange the freight. Freight charges apply. Please call 1-800-438-5346 for a quote. Click here to learn more about shipping by freight. 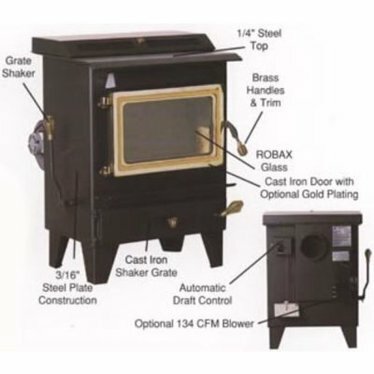 The is one of the best coal heat stoves that i have ever used. Mine is 9 years old and work perfect. I was raised by coal heat. Now I heat my 6000 sq ft home with Hitzer stoves. Workmanship is unmatched, simply a great piece of work and an asset. This is an outstanding stove. The fuel requires daily work but coal is the largest producer of energy at the the lowest cost per day. Control the stoves air intake and you can control the temperature , and the rate your fuel is expended. Work with it you will be surprised how cheep warm can be.